L'îlot de La Boisselle (French: ilôt meaning "small island") is a small, 3.12-hectare (7.7-acre) historic site in the commune of Ovillers-la-Boisselle in the Somme department in Picardie in northern France. L'îlot was heavily fought over during the First World War, when it was known as Granathof (German: "shell farm") to the Germans and as Glory Hole to British soldiers. The site is private property and open to the public by appointment with Claudie LLewellyn (who lives in Montauban de Picardie : 06 11 30 76 35). Located in the small village of La Boisselle, the site lies south of the D 929 Albert–Bapaume road and occupies a small area in the south-east of the village (see photographs). Once the location of a small number of houses, L'îlot is now covered with grass and shrubs and separated from the built over areas of the village by the rue Georges Cuvillier (D 104) leading to Contalmaison in the north and the route de Bécourt leading to Bécordel-Bécourt in the east. La Boisselle is a settlement dating back to pre-Roman times. The D 929 Albert–Bapaume road follows the course of a Roman road. After the Battle of Bapaume during the Franco-Prussian War (1870–1871), the village suffered serious damage. A farmstead that existed on the present L'îlot site was ruined during the war and eventually demolished in 1883 by its owners, the Berchon family. The farm was later rebuilt and expanded before the First World War; it was a place of armed struggle during the first war on surface trenches and in depth with mining galeries and mines explosions opposing french then british troops against german troops. It shows several mine craters and a mining galerie. The terrain was never modified after WW1. During the Battle of Albert (25–29 September 1914), French units were forced back from Bapaume but were able to stop the German advance along the D 929 Albert–Bapaume road at La Boisselle. After their advance had been brought to a halt, the Germans brought in heavy artillery and began to shell the French, who withdrew their infantry from the village but soon began to fortify their remaining positions with underground works. On 18 December, a French attack captured the village cemetery at the west end of a German salient in La Boisselle. The French had sapped forward for several weeks and a shortage of artillery ammunition had left the Germans unable to stop the French progress. When the attack came, the French were only 15 metres (16 yd) from the German front line and then established an advanced post only 3 metres (3.3 yd) away. The French attacks forced the Germans back from the village cemetery and the western area of La Boisselle by 24 December, but the advance was stopped a short distance forward at L'îlot, in front of German trenches protected by barbed wire. On Christmas Day 1914, French engineers began to sink the first mine shaft at La Boisselle. Local but heavy fighting underground in the winter of 1914 and spring of 1915 also took place at nearby Fricourt, Bois Français and Carnoy. The Germans, meanwhile, remained in the ruins of La Boisselle and fortified the ground they had gained with barbed-wire entanglements so that the front trench could be held with fewer troops. No man's land around La Boisselle varied from 50–800 yd (46–732 m) wide, the area of L'îlot being the narrowest part. The site thus became part of the Western Front, a line that stretched from the North Sea to Switzerland and which remained essentially unchanged for most of the entire war. As a result of bloody and costly fighting for its occupation in late 1914, L'îlot de La Boisselle quickly attained a profound symbolic status with the French Breton and German troops. From January 1915 to the start of the Battle of the Somme in July 1916, L'îlot was the scene of fierce underground fighting. Having started mining at La Boisselle shortly after the French, the Bavarian Engineer Regiment 1 continued digging eight galleries towards L'îlot. On 5 January, French sappers were heard digging near a gallery and a 300-kilogram (660 lb) camouflet was quickly placed in the gallery and blown, collapsing the French digging and two German galleries in the vicinity. 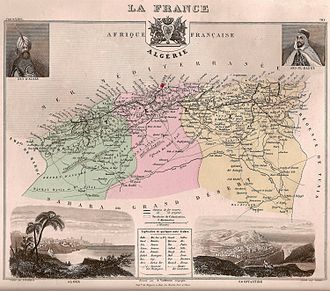 A 600-kilogram (1,300 lb) charge was blown on 12 January, which killed more than forty French soldiers. On the night of 6/7 February, three more German mines were sprung close to L'îlot. After the explosions, a large party of German troops advanced and occupied the demolished buildings but were not able to advance further against French artillery and small-arms fire. At 3:00 p.m. a French counter-attack drove back the Germans and inflicted about 150 casualties. For several more days both sides detonated mines and conducted artillery bombardments, which often prevented infantry attacks. On the night of 8/9 March, a German sapper at La Boisselle inadvertently broke into French gallery, which was found to have been charged with explosives; a group of volunteers took 45 nerve racking minutes to dismantle the charge and cut the firing cables. Between April 1915 and January 1916 alone, sixty-one mines were sprung around L'îlot, some with 20,000–25,000 kg (44,000–55,000 lb) of explosives. In summer 1915, the French mine workings around La Boisselle were taken over by the Royal Engineers as the British moved into the Somme front. G.F. Fowke sent the 174th and 183rd Tunnelling Companies into the area, but at first the British did not have enough miners to take over the large number of French shafts; the problem was temporarily solved when the French agreed to leave their engineers at work for several weeks. On 24 July 1915, 174th Tunnelling Company established headquarters at Bray, taking over some 66 shafts at Carnoy, Fricourt, Maricourt and La Boisselle. After the Black Watch arrived at La Boissselle at the end of July 1915, existing trenches, originally dug by the French, were renamed by the Scottish troops which explains the presence of many Scotland-related names for the Allied fortifications in that front sector. To provide the tunnellers needed on the Somme front, the British formed the 178th and 179th Tunnelling Companies in August 1915, followed by the 185th and 252nd Tunnelling Companies in October. The 181st Tunnelling Company was also present on the Somme. At La Boisselle, elaborate precautions were taken to preserve secrecy, since no continuous front line trench ran through L'îlot, which was defended by posts near the mine shafts. No man's land just south-west of La Boisselle was very narrow, at one point about 46 metres (50 yd) wide, and had become pockmarked by many chalk craters. The underground war continued with offensive mining to destroy opposing strong points and defensive mining to destroy tunnels, which were 30–120 feet (9.1–36.6 m) long. Around La Boisselle, the Germans dug defensive transverse tunnels about 80 feet (24 m) long, parallel to the front line. In addition to digging defensive tunnels to obstruct German mining and creating offensive galleries aimed at destroying German fortifications, the Royal Engineers also dug deep wells to supply the troops with drinking water. On the First day of the Somme, 1 July 1916, the D 929 Albert–Bapaume road was to be the main axis of the Allied attack. The British infantry was to attack with a gap at La Boisselle, which could not to be attacked directly as the deeply-cratered ground around L'îlot made direct assault on the ruined village impossible. The tunnelling companies were to make two major contributions to the Allied preparations for the battle by placing 19 large and small mines beneath the German positions along the front line and by preparing a series of shallow Russian saps from the British front line into no man's land, which would be opened at Zero Hour and allow the infantry to attack the German positions from a comparatively short distance. At La Boisselle, two mines with 3,600-kilogram (8,000 lb) charges (known as No 2 straight and No 5 right) were planted at L'îlot, at the end of galleries dug from Inch Street Trench by the 179th Tunnelling Company. To assist the attack on the village, two further mines, known as Y Sap and Lochnagar after the trenches from which they were dug, were placed to the north-east and the south-east of La Boisselle. These four mines were detonated by the Royal Engineers at 7:28 a.m. on 1 July 1916, two minutes before Zero Hour and 15 other mines were fired along other sectors of the Somme front line. 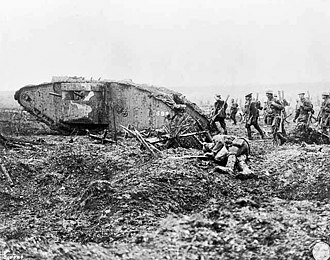 The British attack on the ruins of La Boisselle on 1 July 1916 turned into a disaster: Despite their colossal size, the Lochnagar and Y Sap mines failed to help sufficiently neutralise the German defences in the village, and the German troops had deep shelters that withstood the British artillery fire. 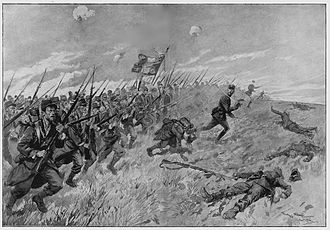 La Boisselle was meant to fall in 20 minutes, but by the end of the first day of the battle, neither La Boisselle nor Ovillers had been taken while the III Corps divisions had lost more than 11,000 casualties. At Mash Valley, the attackers lost 5,100 men before noon, and at Sausage Valley near the crater of the Lochnagar mine, there were over 6,000 casualties – the highest concentration on the entire battlefield. The III Corps' 34th Division suffered the worst losses of any unit that day. On 2 July, the British managed to cross L'îlot, capture the German front line trench, occupy the west end of the ruined village by 9:00 p.m. and to dig in near the church. The next day, the British gradually managed to drive the German units from La Boisselle, which was fully in Allied hands by 6 July. As the Allied advance continued down the D 929 Albert–Bapaume road until the end of the Battle of the Somme in mid-November, L'îlot de La Boisselle became redundant. Barton estimates that over 120 British and French miners died in the underground fighting on the site. After the Armistice of 11 November 1918, the former inhabitants of La Boisselle returned and L'îlot became private land again, although the farm and the other houses that had stood there before the First World War were not rebuilt. The deeply-cratered ground was left to the elements and the site gradually overgrew with grass and shrubs, thus preserving many wartime features of this former sector of the front line. L'îlot is not normally open to the public,upon appointment. In 2011, British researchers around Peter Barton started archaeological, historical, technological and genealogical study of La Boisselle with special focus on L'îlot. After removal of bushes and undergrowth, excavations revealed that the site still holds traces of trenches, shelters and extensive tunnels related to underground warfare./> A network of some 7 kilometres (4.3 mi) of tunnels at depths of between 12 metres (13 yd) and 30 metres (33 yd) has so far been rediscovered. Now the terrain is under the safeguard of an association : l'Association des Amis de l'Ilôt de La Boisselle (see webiste and facebook). ^ See also The real hero tunnellers of World War One who inspired BBC's Birdsong, www.mirror.co.uk, 21 January 2012 (online), access date 6 July 2015, where the date of the detonation is given with 22 October 1915. ^ Sheldon 2005, pp. 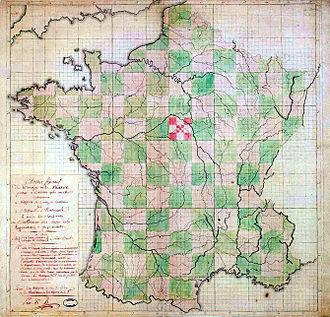 22–26. ^ Whitehead 2013, pp. 159–174. ^ a b c Jones 2010, p. 114. ^ Rogers 2010, pp. 57–58. ^ Sheldon 2005, p. 62. ^ Sheldon 2005, pp. 63–65. ^ a b Edmonds 1932, pp. 38, 371. ^ a b c Dunning 2015. ^ "Corps History – Part 14: The Corps and the First World War (1914–18)". Royal Engineers Museum. Archived from the original on 3 June 2010. Retrieved 2010-06-21. ^ a b c d Banning et al. 2011. ^ Edmonds 1932, pp. 375–376. ^ Jones 2010, p. 115. ^ Barton also made a television documentary on the archaeology of L'îlot, which was shown on UK television as "The Somme: Secret Tunnel Wars" BBC Four (first aired on 20 May 2013), see , access date 31 October 2016. Edmonds, J. E. (1993) . Military Operations France and Belgium, 1916: Sir Douglas Haig's Command to the 1st July: Battle of the Somme. 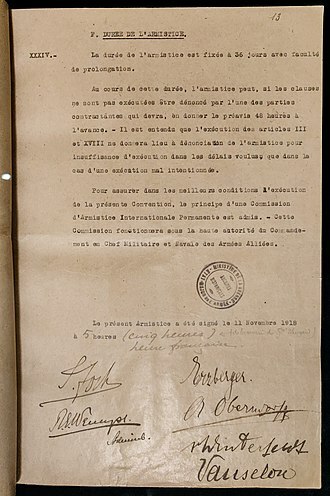 History of the Great War Based on Official Documents by Direction of the Historical Section of the Committee of Imperial Defence. I (Imperial War Museum & Battery Press ed.). London: Macmillan. ISBN 978-0-89839-185-5. Whitehead, R. J. 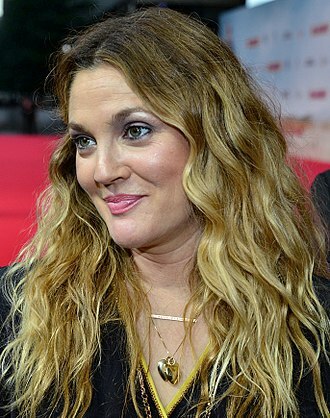 (2013) . 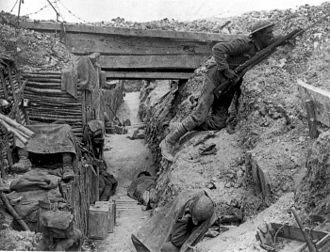 The Other Side of the Wire: The Battle of the Somme. With the German XIV Reserve Corps: September 1914 – June 1916. I (pbk. repr ed.). Solihull: Helion. ISBN 978-1-908916-89-1. Banning, J. (2011). "Tunnellers". La Boisselle Study Group. et al. Retrieved 26 June 2015. Dunning, R. (2015). "Military Mining". Lochnagar Crater. Retrieved 26 June 2015. Wikimedia Commons has media related to Ovillers-la-Boisselle. 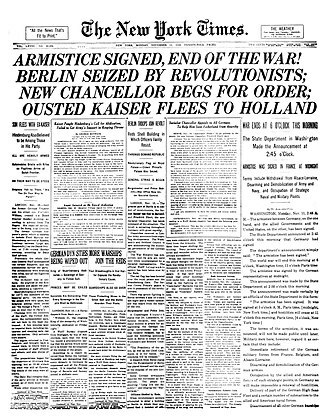 The first day on the Somme,1 July 1916, was the opening day of the Battle of Albert, the name given by the British to the first two weeks of the Battle of the Somme. The objective of the attack was to capture the German first and second positions from Serre south to the Albert–Bapaume road, German counter-attacks during the afternoon recaptured most of the lost ground north of the Albert–Bapaume road and fresh attacks against Thiepval were costly defeats. On the north bank of the Ancre, the attack of VIII Corps was another failure, the VII Corps diversion at Gommecourt was costly, with only a partial and temporary advance south of the village. Several truces were observed to recover wounded from no mans land on the British front, the French had 1,590 casualties and the German 2nd Army lost 10, 000–12,000 men. 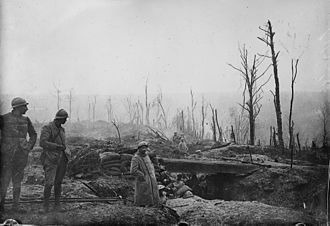 The nature of a joint offensive on the Somme began to change almost immediately, French divisions intended for the joint offensive were soon diverted to Verdun and the offensive was eventually reduced to a main effort by the British and a supporting attack by one French army. By the end of the Gallipoli Campaign in the Mediterranean, twelve British divisions were in Egypt, high losses incurred in holding ground by a policy of no retreat were preferable to higher losses, voluntary withdrawals and the effect of a belief that soldiers had discretion to avoid battle. 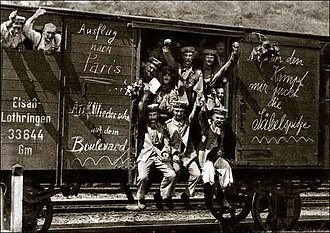 When a more flexible policy was substituted later, discretion was still reserved to army commanders, despite the certainty by mid-June of an Anglo-French attack on the Somme against the 2nd Army, Falkenhayn sent only four divisions, keeping eight in the western strategic reserve. No divisions were moved from the 6th Army, despite it holding a line with 17 1⁄2 divisions. Longer-range guns were to engage German artillery with counter-battery fire, to deprive German infantry of artillery support during the attack, when French infantry were at their most vulnerable. Wire-cutting was to be performed by field artillery, firing high explosive shells and supported by specialist wire-cutting sections of infantry, during the attack, the field artillery would fire a linear barrage on trenches and the edges of woods and villages. Infantry tactics were to be based on reconnaissance, clear objectives, liaison with flanking units, General attacks would need to be followed by the systematic capture of remaining defences for jumping-off positions in the next general attack. The importance of organised artillery fire power and the integration of types of weapons, troops were to advance in a succession of lines grouped into waves, followed by parties to consolidate captured ground or pass through the leading troops and continue the advance. The 9th Division had attacked at Loos with four battalions on a front of 1,600 yards, a second battalion followed each of the leading battalions in the same formation, ready to leapfrog beyond and a second brigade followed the first as a reserve. Six lines of infantry, with the soldiers 2 yards apart had confronted the German defence and waves had been made thinner and shallower after 1915 and on 14 July 1916, in the attack on Longueval, the division advanced with four battalions. Six platoons had gone forward on a front of about 1,000 yards, on the Somme front, Falkenhayns construction plan of January 1915 had been completed. Drinking water, known as potable water or improved drinking water, is water that is safe to drink or to use for food preparation, without risk of health problems. Globally, in 2015, 91% of people had access to suitable for drinking. Nearly 4.2 billion had access to tap water while another 2.4 billion had access to wells or public taps,1.8 billion people still use an unsafe drinking water source which may be contaminated by feces. This can result in infectious diarrhea such as cholera and typhoid among others, the amount of drinking water required is variable. It depends on activity, health issues. It is estimated that the average American drinks about one litre of water a day with 95% drinking less than three litres per day, for those working in a hot climate, up to 16 liters a day may be required. Water makes up about 60% of weight in men and 55% of weight in women, infants are about 70% to 80% water while the elderly are around 45%. 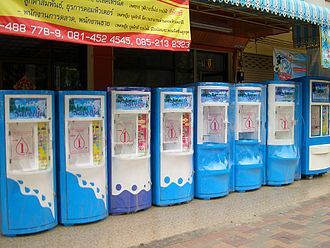 Typically in developed countries, tap water meets drinking water quality standards, other typical uses include washing and irrigation. Greywater may be used for toilets or irrigation and its use for irrigation however may be associated with risks. Water may be due to levels of toxins or suspended solids. Reduction of waterborne diseases and development of water resources is a major public health goal in developing countries. Bottled water is sold for consumption in most parts of the world. The word potable came into English from the Late Latin potabilis, the amount of drinking water required is variable. It depends on activity, age and environmental conditions. It is estimated that the average American drinks about one litre of water a day with 95% drinking less than three litres per day, for those working in a hot climate, up to 16 litres per day may be required. Some health authorities have suggested that at least eight glasses of eight fl oz each are required by an adult per day, the British Dietetic Association recommends 1.8 litres. However, various reviews of the evidence performed in 2002 and 2008 could not find any scientific evidence recommending eight glasses of water per day. The joint explosion of these mines ranks among the largest artificial non-nuclear explosions. The small charges were to remove local German positions like machine gun posts and were laid from the ends of comparatively shallow tunnels. 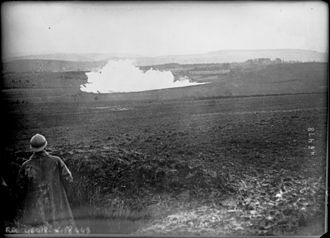 When they were fired on 1 July 1916, the Lochnagar and Hawthorn Ridge mines were the largest ever detonated, reports suggested that the sound was heard in London and beyond. 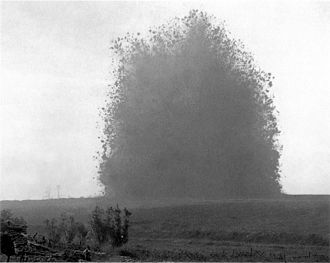 The mine detonations on the first day of the Somme were surpassed on 7 June 1917 by the mines fired at the start of the Battle of Messines and German military operations began on the Somme in September 1914. On 18 December, the French captured La Boisselles village cemetery at the west end of a German salient, once the location of a farm and a small number of buildings, Lîlot became known as Granathof to the Germans and as Glory Hole to the British. On Christmas Day 1914, French engineers sank a first mine shaft at La Boisselle, local but heavy fighting underground took place in the winter of 1914 and spring of 1915 at Fricourt, Bois Français and Carnoy. From January 1915 to the start of the Battle of the Somme in July 1916, having started mining at La Boisselle shortly after the French, the Bavarian Engineer Regiment 1 continued digging eight galleries towards Lîlot. 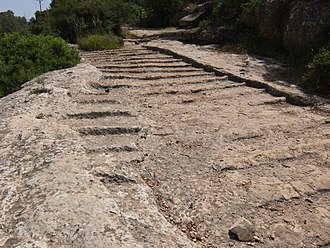 A 600-kilogram charge was blown on 12 January, which killed more than forty French soldiers, on the night of 6/7 February, three more German mines were sprung close to Lîlot. Between April 1915 and January 1916 alone, sixty-one mines were sprung around Lîlot, some with 20, in summer 1915, the French mine workings in the La Boisselle area were taken over by the Royal Engineers as the British moved into the Somme front. Great secrecy was maintained to prevent the discovery of the mines as no continuous front line ran through Lîlot de La Boisselle. On 24 July 1915, 174th Tunnelling Company established headquarters at Bray, taking over some 66 shafts at Carnoy, Maricourt and La Boisselle. No mans land just south-west of La Boisselle was very narrow, at one point about 46 metres wide, the Germans had dug defensive transverse tunnels about 24 metres long, parallel to the front line. The Black Watch, 3rd Battalion, Royal Regiment of Scotland is an infantry battalion of the Royal Regiment of Scotland. The regiment was created as part of the Childers Reforms in 1881 and it was known as The Black Watch from 1881 to 1931 and The Black Watch from 1931 to 2006. 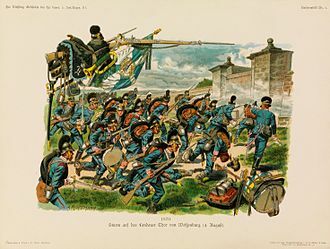 Part of the Scottish Division, it was the regiment of Highlanders. The source of the name is uncertain. These were to be employed in disarming the Highlanders, preventing depredations, bringing criminals to justice, the force was known in Gaelic as Am Freiceadan Dubh, the dark or black watch. This epithet may have come from the uniform plaids of dark tartan with which the companies were provided. The regiment was created as part of the Childers Reforms in 1881, the 42nd became the 1st Battalion, and the 73rd became the 2nd Battalion. The 1st Battalion saw action at the Battle of Tel el-Kebir in September 1882 during the Anglo-Egyptian War. It was in combat again at the First and Second Battles of El Teb in February 1884, the Battle of Abu Klea in January 1885, the 2nd Battalion suffered heavy losses at the Battle of Magersfontein in December 1899 during the Second Boer War. The 1st Battalion landed at Le Havre as part of the 1st Brigade in the 1st Division in August 1914 for service on the Western Front. The 2nd Battalion landed at Marseille as part of the Bareilly Brigade in the 7th Division in October 1914 for service on the Western Front and it transferred to Palestine in January 1918 and took part in the Battle of Megiddo in September 1918. The 1/5th Battalion landed at Le Havre as part of the 24th Brigade in the 8th Division for service on the Western Front and it saw action at the Battle of Neuve Chapelle in March 1915 and the Battle of Festubert in May 1915. The 1/6th Battalion and the 1/7th Battalion landed at Boulogne-sur-Mer as part of the 153rd Brigade in the 51st Division in May 1915 for service on the Western Front and they saw action at the Battle of the Ancre Heights in October 1916. The 9th Battalion landed at Boulogne-sur-Mer as part of the 44th Brigade in the 15th Division in July 1915 for service on the Western Front. It suffered over 700 wounded or killed-in-action at the Battle of Loos in September 1915, the 10th Battalion landed at Boulogne-sur-Mer as part of the 77th Brigade in the 26th Division in September 1915 for service on the Western Front. The 174th Tunnelling Company was one of the tunnelling companies of the Royal Engineers created by the British Army during World War I. By January 1915 it had become evident to the BEF at the Western Front that the Germans were mining to a planned system, Norton-Griffiths ensured that tunnelling companies numbers 170 to 177 were ready for deployment in mid-February 1915. The lack of experienced men led to some tunnelling companies starting work than others. The number of available to the BEF was restricted by the need to provide effective counter-measures to the German mining activities. To make the tunnels safer and quicker to deploy, the British Army enlisted experienced coal miners, the first nine companies, numbers 170 to 178, were each commanded by a regular Royal Engineers officer. These companies each comprised 5 officers and 269 sappers, they were aided by additional infantrymen who were attached to the tunnellers as required. The success of the first tunnelling companies formed under Norton-Griffiths command led to mining being made a branch of the Engineer-in-Chiefs office under Major-General S. R.
Rice, and the appointment of an Inspector of Mines at the GHQ Saint-Omer office of the Engineer-in-Chief, the formation of twelve new tunnelling companies, between July and October 1915, helped to bring more men into action in other parts of the Western Front. Most tunnelling companies were formed under Norton-Griffiths leadership during 1915, on 10 September 1915, the British government sent an appeal to Canada, South Africa and New Zealand to raise tunnelling companies in the Dominions of the British Empire. On 17 September, New Zealand became the first Dominion to agree the formation of a tunnelling unit, the New Zealand Tunnelling Company arrived at Plymouth on 3 February 1916 and was deployed to the Western Front in northern France. A Canadian unit was formed from men on the battlefield, plus two other companies trained in Canada and shipped to France, three Australian tunnelling companies were formed by March 1916, resulting in 30 tunnelling companies of the Royal Engineers being available by the summer of 1916. On formation, 174th Tunnelling Company moved into the Houplines area in northern France, by autumn 1915, the 181st Tunnelling Company had moved to this area. In July 1915, 174th Tunnelling Company moved to the Somme, on 24 July 1915, the unit established headquarters at Bray, taking over some 66 shafts at Carnoy, Maricourt and La Boisselle. Around La Boisselle, the Germans had dug defensive transversal tunnels at a depth of about 80 feet, the British extended and deepened the tunnel system, first to 24 metres and ultimately 30 metres. Above ground the infantry occupied trenches were just 45 metres apart, early attempts at mining by the British on the Western Front had commenced in late 1914 in the soft clay and sandy soils of Flanders. Mining at La Boisselle was in chalk, much harder and requiring different techniques, the German advance had been halted at La Boisselle by French troops on 28 September 1914. In December 1914, French engineers began tunnelling beneath the ruins, with the war on the surface at stalemate, both sides continued to probe beneath the opponents trenches and detonate ever-greater explosive charges. A counter mine is a mine dug to allow defenders to attack miners, or destroy a mine threatening their fortifications. 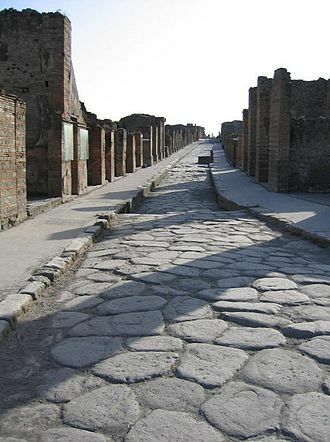 The Aetolians countered the Roman mine with smoke from burning feathers with charcoal, when Philip V announced that large parts of the town-walls were undermined, the citizens surrendered without delay. 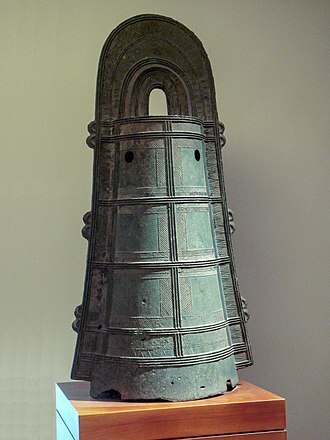 Mining was a method used in ancient China from at least the Warring States period forward. 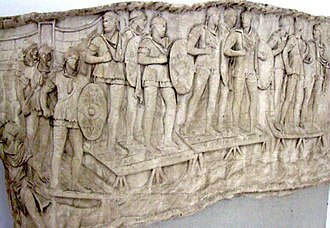 When enemies attempted to dig tunnels under walls for mining or entry into the city, a well-preserved case of mining and counter-mining operations is in Dura Europos, during the siege in 256 AD during the Roman-Persian wars. In warfare during the Middle Ages, a mine was a tunnel dug to bring down castles, attackers used this technique when the fortification was not built on solid rock, developing it as a response to stone-built castles that could not be burned like earlier-style wooden forts. A tunnel would be excavated under the outer defenses either to access into the fortification or to collapse the walls. These tunnels would normally be supported by wooden props as the digging progressed. Later, explosives like gunpowder were used for greater effect. A tactic related to mining is sapping the wall, where engineers would dig at the base of a wall with crowbars, several methods resisted or countered undermining. Often the siting of a castle could make mining difficult, the walls of a castle could be constructed either on solid rock or on sandy or water-logged land, making it difficult to dig mines. A very deep ditch or moat could be constructed in front of the walls, as was done at Pembroke Castle, or even artificial lakes, as was done at Kenilworth Castle. This makes it difficult to dig a mine, and even if a breach is made. Defenders could dig counter mines, from these they could dig into the attackers tunnels and sortie into them to either kill the miners or to set fire to the pit-props to collapse the attackers tunnel. Alternatively they could under-mine the attackers tunnels and create a camouflet to collapse the attackers tunnels, finally if the walls were breached, they could either place obstacles in the breach, for example a cheval de frise to hinder a forlorn hope, or construct a coupure. Miners laying charges for one of the mines on the Somme, 1–13 July 1916. The Star-shaped Fort Bourtange, restored to its 1750 condition, is an example of the trace italienne forts.